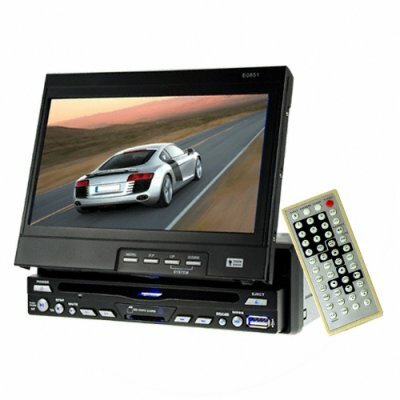 Successfully Added 1-DIN Car DVD Player With Touch Screen 7 Inch TFT LCD to your Shopping Cart. Single DIN sized vehicle multi-media player with 7 inch touchscreen TFT LCD screen for playing all of your favorite media; including CD's, DVD's, TV, radio, digital music and video files on an SD card, USB, or disc. This model car multi media + DVD player features an extra large 7 inch motorized display with an open/close function, excellent compatibility with many digital formats and disks, and a fully interactive Bluetooth connection manager for both making and receiving calls through the stereo system. A great wholesale price makes this car DVD + multimedia player perfect either for the resale market, OEM market, or personal/company use. As always, it is available direct to you from the original source for wholesale direct from China electronic products, Chinavasion. Car DVD + multimedia player, perfect for the person who wants to take all their digital entertainment on the road with them. Single DIN sized unit does not take up too much dashboard space, yet provides you with a screen size fitting for a king. Do you live in Western Europe? Want GPS? This model has a sister GPS module that can be purchased as a simple add-on for those people in Western Europe who want a reliable and licensed GPS map system with online updates. See model number CVSEG-A4102. If you wish to make comments or reviews about this product, login and use the product review box. Please open a support ticket if you have questions regarding this item.